You'll be £7.00 closer to your next £10.00 credit when you purchase Captain Cook's War & Peace. What's this? Why was James Cook chosen to lead the Endeavour expedition to the Pacific in 1768? As this new book shows, by that date he had become supremely and uniquely qualified for the exacting tasks of exploration. This was a period when who you were and who you knew counted for more than ability, but Cook, through his own skills and application, rose up through the ranks of the Navy to become a remarkable seaman to whom men of influence took notice; Generals such as Wolfe and politicians like Lord Egmont took his advice and recognised his qualities. Highly readable and displaying much new research, this is an important new book for Cook scholars and armchair explorers alike. Well researched. This work is highly recommended because it is, in a way, the missing element in Cook’s biography, and a pretext to Robson’s other two books about the great navigator, showing Cook’s amazing success in a period in which who you were, and who you knew, often counted for more than ability. An interesting book about a famous figure, well worth reading for those naval history buffs. Overwhelmingly Robsons meticulous research and the Sabatini-esque mastery of his material has produced a book that will be warmly welcomed by Cook enthusiasts, and appreciated by others who may not have as abiding fascination with a taciturn Yorkshire seaman as does Robson, but who can appreciate fine historical writing and admirable scholarship when they see it. James Cook's early years as a hydrographer during and following the Seven Years' War left a legacy so valuable that the charts he produced of the Newfoundland Coast were still in use in the mid-twentieth century. He learnt his trade during the operations to capture the French fortress of Louisbourg in Cape Breton Island, and his survey work made possible Admiral Sir Charles Saunders' naval assault on Quebec in 1759 - 250 years ago. His charts are his monuments, but apart from them, and the official naval record, little is known about his life during this period. It is hardly surprising that the better-known studies of his life and work dwelt upon his years in the Pacific. Robson has attempted to rectify that deficiency, as did Victor Suthren in 2000. Suthren's credentials for his work included that of historian at fortress Louisbourg, Director General of the Canadian War Museum from 1986 to 1997, and sailing experience such that in 1997 he was appointed an Honorary Captain in the Canadian Navy. His experience as an author was that of a novelist. Robson's credentials include two previous works on Cook, and he is employed as map librarian at the University of Waikato, in Hamilton, New Zealand. Given the limitations on the available sources it is not surprising that both authors depended heavily on contextual material to give substance to their books. Suthren compensated for the lack of material on Cook by writing an effective summary of the Louisbourg and Quebec campaigns. Robson has also had to depend heavily on contextual material, including brief accounts of the Louisbourg and Quebec campaigns and another of de Ternay's attack on St John's, but has also gone further in describing Cook's work on the Newfoundland coast. His text is well written, and is well supported with quotations from correspondence, archival references, and exhaustive bibliography, and reproductions from his charts. He has also employed a system of parallel texts in which he provides short accounts of the lives of people who came into contact with Cook, accounts of naval organization, contemporary historical events, and so on. This structure almost transforms the book into a magazine, and might have been more suited to his earlier Cook encyclopaedia. For the reader, the uniform typography throughout the book means that the body text and the information boxes, some of which exceed a page in length, become confused. Had Robson confined himself to a conventional book form the results would have made more enjoyable reading. There are forty-three information boxes which contain much the reader will want to know in order to understand the main text. The material might better have been included there. As they have been kept separate it might have been supposed that the author wanted people to be able to use them as stand-alone reference material. But that supposition is confounded by the fact that they are not mentioned in the table of contents. These are serious criticisms, but on the positive side, it can be said that Robson has thoroughly researched his subject, and understands the value of his material. The book itself is well printed and, apart from the problem with the information boxes, is easy to read. The four pages of colour and eight pages of black and white plates are very well chosen and clearly reproduced, and integrated into the text are eighteen very useful maps with several additional reproductions. Robson acknowledges that Cook's exploration of the South Pacific is well known and well documented in many, many books. Instead, it is the early years of his professional career that are recorded here. He does not focus upon Cook's childhood, or service on various colliers as a youth, but instead, shows how his sailing, navigational, surveying, and management skills developed while serving in the Royal Navy, especially his service in Newfoundland. This volume is not for people simply interested in James Cook's adventures during his three voyages to the South Pacific, but is aimed at those who wish to learn more about how he acquired the skills that made him an attractive choice for the assignment to explore and scientifically document the flora, fauna, ethnicity, and potential resources there. Indeed, there is little mention of his three explorations in the Pacific, 1768-1779, while the 13-year period between 1755 and 1768 is reported in great detail. The author poses the question at the end of the Introduction, "Why was James Cook chosen to lead the Endeavour expedition to the South Pacific"? He answers with, "After having read this book, I hope that you would conclude, why the Admiralty would have chosen anyone else?" A brief introduction provides some insight into Cook's family background and early years in Marton, Yorkshire. At age 16 he relocates to a coastal fishing village, is introduced to the North Sea coal trade, and signs on to a ship, likely as an apprentice. Robson provides sufficient information here to set up the remainder of the book, but there is not a great deal of detail. Robson has somewhat informally divided the 1755 to 1768 time frame into two main sections, beginning with an overview of the Seven Years' War, or as Robson puts it, "Captain Cook's War". In Part I, he follows with chapters documenting Cook joining the Royal Navy, assignments on several ships, his time in Louisbourg, service in Nova Scotia, and participation in the war against the French on the St. Lawrence River - the siege of Quebec. "Captain Cook's Peace", Part II of the book, is mainly devoted to his thorough surveying and cartography of Newfoundland. Robson provides considerable detail about the surveying process along the coastline of Newfoundland, noting that Cook's maps were of such high quality and exceptional detail that they were used well into the 19th century. Robson provides excellent background information about the Seven Years' War, relating that it is known by a number of appellations in differing parts of the world, clearing up confusion about the relationship between it and the French and Indian War, Third Silesian War, and the Third Carnatic War. He ties Cook's assignments to the conflict in North America with the French in Nova Scotia, Quebec, and Newfoundland. Robson includes numerous "boxes" within the text which provide more detail about material mentioned in the regular part of the chapters. For example, in the chapter entitled "Quebec", one of the "boxes" focuses upon James Wolfe, the British General who defeated the French in Canada and gives an encyclopaedic recount of his life and career. There are many boxes focusing upon people who cross paths with Cook, such as Hugh Palliser, and other boxes with entirely different emphases, such as Joseph Banks' Recipe for Spruce Beer, and an introduction to Newfoundland's pre-history, history and geography. These boxes are not distracting and are better placed in this fashion than they would be as appendices. Robson provides a detailed and thorough account of Cook's career and contribution to seamanship, surveying, astronomical observations, cartography, and exploration. Numerous examples of Cook's maps and charts are provided. The author also includes excellent maps which show the location of the area discussed in the text. This is very useful, because most readers would not have a detailed mental map of the south coast of Newfoundland, for example; the places mentioned in the text mean so much more when the reader can leaf back to the map and see their absolute locations. He makes use of a myriad of sources, having conducted research in the United Kingdom, the United States, Canada, and New Zealand, using letters, logs, notes, journals, and formal government records in order to document Cook's early naval assignments. This work is not just a reiteration of material appearing elsewhere; there is considerable new, unpublished research included, too. The question which he poses at the end of the Introduction, "how could anyone but Cook been chosen to lead the voyages to the South Pacific" is clearly answered! The book is suitable for those interested in sailing history, 18th century British history, the history and geography of exploration, and James Cook's contributions to navigation, surveying, seamanship, cartography, and astronomy. Efficiently organised around Cook's service on particular vessels, the volume includes not only broader geo-political context to each phase of Cook's naval service, but also extracts from log books and other journals, and useful biographical materials on other political and naval figures of the period. John Robson has had two lifelong interests - maps and Captain Cook. Born at Stockton-on-Tees, he is now Map Librarian at the University of Waikato in Hamilton, New Zealand, and President of the New Zealand Map Society. Two of his previous books, The Captain Cook Encyclopaedia and Captain Cook's World both met with critical acclaim. 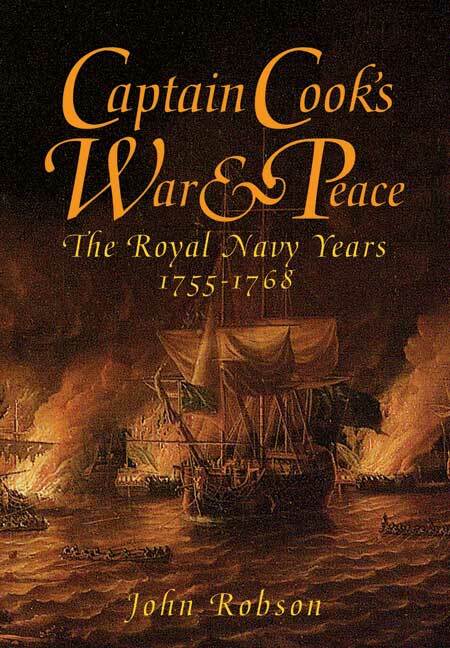 Captain Cook's War & Peace is John's first title with Seaforth Publishing.